So here we are, last day of September which means we are about to enter the month of no sunlight! That sounds scary, but still, we have 26 days remaining, the sunshine reducing about 20 minutes per day until - on the 26th of October - the sun will not come back over the horizon for ~3.5 months! Now...that IS kind of scary! The sun is already pretty low, it doesn't come up very high anymore and - because Longyearbyen is pretty much surrounded by mountains - we are in shadow most of the day except for the afternoon when the sun is right above on of the two glaciers behind our barracks. What happened in the last couple of days: There was a charity relay run in which Luci and I among a couple of other (British) students (thanks Heather, Penny and Nick) participated in fancy dresses. We decided on entering as mummies and also to act as mummies. It was quite a hard job to attach all the toilet paper to ourselves and we lost a good amount of it in the streets of Longyearbyen. But apparently we did such a good job that they spontaneously made up a fourth price to win which was just called "special price" for our team being special and is a day of personal training in the local gym (not sure whether we should take that personal or not). 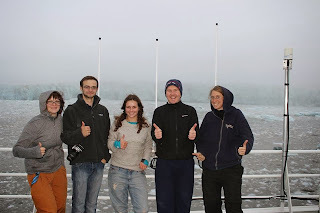 This was just two days prior to our Arctic Marine Geology cruise which took us around the Southern edge of Svalbard into some fjords. We started in beautiful weather, calm sea and sunshine and already on the first day, we could spot quite a lot of whale blows. Unfortunately, they've all been too far away to make out what kind of whale it was. From the second day on, we were covered in fog. It was as if there was just this one, really dense fog cloud following our vessel - the Helmer Hanssen - wherever we were going. On the one hand, it was a bit sad, because we didn't get to see a lot of the stunning landscape and I don't even want to think about how many polar bears and whales could have been really close to us. On the other hand, this gave us plenty of time to analyse the samples we have taken with a gravity corer. This is a massive, 6 meter long pipe which is lowered just above the seafloor and then, a weight is triggered to push the corer as deep as possible into the sediments. 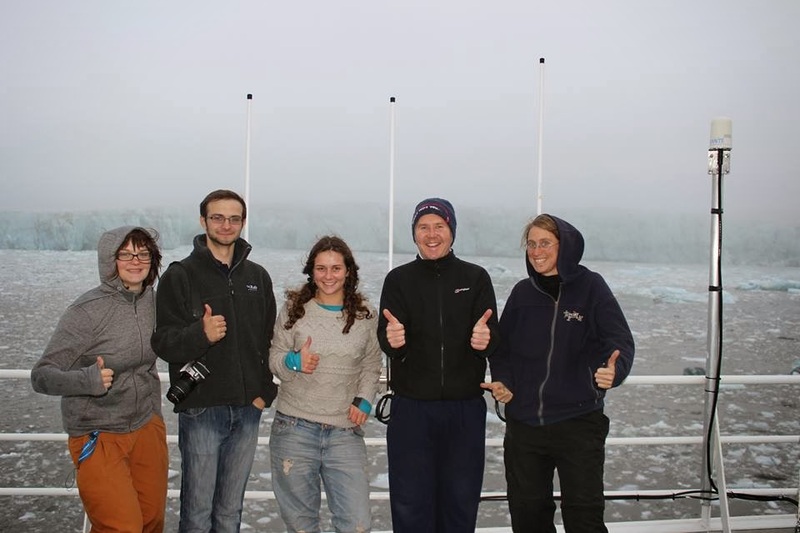 All the cores we have taken were chosen carefully based on multibeam data we collected during the same cruise and were based on some glacial features. The work on board cosisted of splitting the core for further analysis both onboard and back at UNIS in the labs. On board, we conducted lithological logging, measurements for magnetic susceptibility, shear strength, and foraminifera analysis. Especially for the forams, Bill Austin joined our cruise. He is a lecturer in St Andrews and from the 1st of September, he is also teaching at SAMS. Figure 6: Allan all excited about forams! All of these analyses give a first hint about the geological history of that core, e.g. we could find ice-rafted debris, different layers of sand, clay etc. and - especially in the upper layers - different foraminifera species that give us hints about former conditions of the ocean. Basically all, John Howe has tought us in theory, we got to see in real. We are still working on these cores back in the labs and they will be focus of our term projects, so you might here more about it from either one of us. The food onboard was amazing and consisted of three hot meals daily and cake inbetween. Really bad for students that are used to live on peanut butter - jelly sandwiches! Really good to have some proper food though. We even tasted whale! And I have to admit, it actually didn't taste too bad. On our way back, the sun came back out again and we could enjoy the sunshine outside, again spotted some whales in the far distance. Still, I have to say: Svalbard is amazing and I am looking forward to spending the next weeks here. Even if quite a bit will be without the sun!